Peter Norvig realizes that something is broken on the Internet. It's his job to fix it! 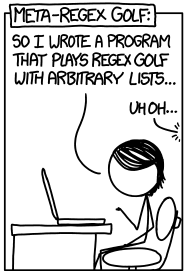 This tutorial shows how to write Python code to play "Regex Golf". I found that the hover text, "/bu|[rn]t|[coy]e|[mtg]a|j|iso|n[hl]|[ae]d|lev|sh|[lnd]i|[po]o|ls/ matches the last names of elected US presidents but not their opponents", contains a confusing contradiction. I'm old enough to remember that Jimmy Carter won one term and lost a second. No regular expression could both match and not match "Carter". But this got me thinking: can I come up with an algorithm to match or beat Randall's regex golf scores? The game is on. "The set of mistakes made by this regex in classifying winners and losers." The xkcd regex incorrectly matches "fremont", representing John C. Frémont, the Republican candidate who lost to James Buchanan in 1856. Could Randall Munroe have made an error? Is someone wrong on the Internet? Investigating the 1856 election, I see that Randall must have had Millard Fillmore, the third-party candidate, as the opponent. Fillmore is more famous, having served as the 13th president (although he never won an election; he became president when Taylor died in office). But Fillmore only got 8 electoral votes in 1856 while Fremont got 114, so I will stick with Fremont in my list of losers. Generate a pool of regex parts: small regexes of a few characters, such as "bu" or "r.e$" or "j". Consider only parts that match at least one winner, but no losers. Our solution will be formed by "or"-ing together some of these parts (e.g. "bu|n.e|j"). This is a set cover problem: pick some of the parts so that they cover all the winners. Set cover is an NP-hard problem, so I feel justified in using an approximation approach that finds a small but not necessarily smallest solution. For many NP-hard problems a good approximation can be had with a greedy algorithm: Pick the "best" part first (the one that covers the most winners with the fewest characters), and repeat, choosing the "best" each time until there are no more winners to cover. To guarantee that we will find a solution, make sure that each winner has at least one part that matches it. The shortest regex might not be a disjunction. Our strategy can only find disjunctions (of the form "a|b|c|..."). The shortest regex might be a disjunction formed with different parts. For example, "[rn]t" is not in our pool of parts. The greedy algorithm isn't guaranteed to find the shortest solution. We might have all the right parts, but pick the wrong ones. The algorithm is below. Our pool of parts is a set of strings created with regex_parts(winners, losers). We accumulate parts into the list solution, which starts empty. On each iteration choose the best part: the one with a maximum score. (I decided by default to score 4 points for each winner matched, minus one point for each character in the part.) We then add the best part to solution, and remove from winners all the strings that are matched by best. Finally, we update the pool, keeping only those parts that still match one or more of the remaining winners. When there are no more winners left, OR together all the solution parts to give the final regular expression string. "Find a regex that matches all winners but no losers (sets of strings)." # Make a pool of regex parts, then pick from them to cover winners. # that still match some winner. "Return a set of all the strings that are matched by regex." winners: A set of strings; our solution is required to match each of them. losers: A set of strings; our solution is not allowed to match any of them. part: A small regular expression, a string, such as 'bu' or 'a.a'. pool: A set of parts from which we will pick a subset to form the solution. regex: A regular expression; a pattern used to match against a string. solution: A regular expression that matches all winners but no losers. For each winner, include a regex that matches the entire string exactly. I call this regex a whole. For each whole, generate subparts consisting of 1 to 4 consecutive characters. For each subpart, generate all ways to replace any of the letters with a dot (the "match any" character). Keep only the dotified subparts that do not match any of the losers. "Return parts that match at least one winner, but no loser." "Return a set of subparts of word: consecutive characters up to length N (default 4)." "Return all ways to replace a subset of chars in part with '.'." Our regex is 15% shorter than Randall's – success! Let's move on to arbitrary lists. I define report, to call findregex, verify the solution, and print the number of characters in the solution, the number of parts, the competitive ratio (the ratio between the lengths of a trivial solution and the actual solution), and the number of winners and losers. "Find a regex to match A but not B, and vice-versa. Print summary." The two movies cost us one more character. Stop here and declare victory! Yay! Try to make the program faster and capable of finding shorter regexes. My first inclination was "stop here", and that's what this notebook will shortly do. But several correspondents offered very interesting suggestions, so I returned to the problem in a second notebook. 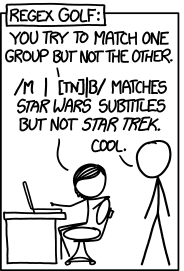 I was asked whether Randall was wrong to come up with "only" a 10-character Star Wars regex, whereas I showed there is a 9-character version. I would say that, given his role as a cartoonist, author, public speaker, educator, and entertainer, he has chosen ... wisely. He wrote a program that was good enough to allow him to make a great webcomic. A 9-character regex would not improve the comic. Randall stated that he used a genetic algorithm to find his regexes, and it has been said that genetic algorithms are often the second (or was it the third?) best method to solve any problem, and that's all he needed. But if you consider that in addition to all those roles, Randall is also still a practicing computer scientist, you could say he chose ... poorly. Genetic algorithms are good when you want to combine the structure of two solutions to yield a better solution, so they would work well if the best regexes had a complicated tree structure. But they don't! The best solutions are disjunctions of small parts. So the genetic algorithm is trying to combine the first half of one disjunction with the second half of another—but that isn't useful, because the components of a disjunction are unordered; imposing an ordering on them doesn't help. Found an interesting problem (in a comic strip) and realized that it would not be hard to program a solution. Wrote the function mistakes to prove that we really understand exactly what the problem is. Came up with an approach: create lots of regex parts, and "or" together a subset of them. Realized that this is an instance of a known problem, set cover. Since set cover is computationally expensive, decide to use a greedy algorithm, which will be efficient (although not optimal). Decided what goes into the pool of regex parts. Implemented an algorithm to greedily pick parts from the pool (the function findregex). Tried the algorithm on some examples. Thanks especially to Randall Munroe for inspiring me to do this, to regex.alf.nu for inspiring Randall, to Sean Lip for correcting "Wilkie" to "Willkie," and to Davide Canton, Thomas Breuel, and Stefan Pochmann for providing suggestions to improve my code.